Make sure that this is on your ‘Bucket List’, as the bucket is filling! There is a world class tourism magnet that is right in our back yard. The problem is that it only comes to showcase itself at its spectacular best on average every 25 years. Birds such as Pelicans are drawn to a filled lake from southern coastal regions of Australia, and from as far afield as Papua New Guinea. During the 1989—90 flood, it was estimated that 200,000 pelicans, 80 percent of Australia’s total population, came to feed and roost. Scientists are presently unable to determine how such birds appear able to detect the filling of the lake, even when hundreds or thousands of miles away from the basin. Of course I am talking about Lake Eyre. Recent rains in the ‘Channel Country’ in northern Australia are making their way south and the lake is filling again. And here is just a few facts to wet your appetite. Lake Ey­re is Australia’s largest salt lake and is located 647Km north east of Adelaide. The lake is the lowest point below sea level on the Australian mainland at 15.2m. The Lake Eyre basin covers over 1 million square kilometres. On average the lake experiences a small flood every three years, a large flood every 10 years and fills only four times in 100 years. Lake Eyre was named after Edward John Eyre, who was the first European to see it in 1840. In 2012 it was officially named “Kati Thanda – Lake Eyre” to recognise the indigenous history of the area. Trade Travel have some excellent packages to the beautiful Lake Eyre, so why not tick it off the bucket list. For what is included it is certainly unbeatable value. 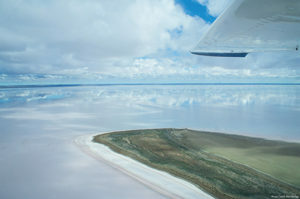 The highlight of the trip undoubtedly will be your scenic 90 minute flight across the stunning waters and salt plains of Lake Eyre. The amazing colours and wildlife will astound you and there is also much more to see including visits to: Bungaree Station, Leigh Creek Mine and picturesque Aroona Dam, the old Farina town ruins, the Marree Hotel and township, the stunning Brachina Gorge, Wilpena Pound, Jeff Morgan Wilpena Pound Panorama, the mining township of Burra, the 1939 Simpson Desert Expedition Memorial and Museum Park as well as a full day Flinders Ranges tour and more. If you or your club members are interested in a tour to Lake Eyre or any Trade Travel Probus Departure then why not take advantage of the new Trade Travel Instalment Plan Option to enable you to pay off your trip. Once your booking has been made and the deposit paid, the payment process becomes easy. We provide a system for you to make small payments of the tour cost as regularly as you like. It’s just like a lay-by system offered by retail chains on goods, but for travel purchases. The only condition is that you must make full payment by the final payment date issued on your invoice. If you would like to know more about this new system or would like a Trade Travel Area Sales Manager to pay your club a visit and explain this to members then give us a call today. It’s easy and it’s a free service. Don’t forget that Trade Travel also has a Consumer Protection Policy in place, so you can rest easy knowing that your funds are safe with them. Call us on 1800 034 439 for a fully detailed itinerary or for more information on these departures or our Instalment Plan.